This award marks the begining of a career in the 7th Fleet. This Lucky 7 Insignia says to all, I survived the 1st 14 days and anything is possible. Awarded for bravery, acts of merit, or meritorious service. The acts of heroism are of a lesser degree than required for the award of the Silver Star. Awarded for bringing one new recruit into the fleet. Awarded to members for honorable service during a time of Federation wide emergency. In essence, this is awarded to members upon acceptance of an in game invitation. This Award is presented for 90 days of active service with the 7th fleet! Completing the Flashpoint: Esseles while a member of an on-level, Squadron exclusive team that chooses only light-side options. Awarded to members for honorable service during a time of Republic wide emergency. In essence, this is awarded to members upon acceptance of an in game invitation. Completing the Flashpoint: Athiss while a member of an on-level, Squadron exclusive team that chooses only light-side options. This Award is presented for 180 days of active service with the 7th fleet! Awarded to members who complete a Mark XI ground set; either Omega Force, Honor Guard or M.A.C.O. This Award is presented for 270 days of active service with the 7th fleet! Awarded for prior service in a Command level position. This Award is presented for 360 days of active service with the 7th fleet! To any Star Fleet Officer who, while serving in any capacity with Star Fleet of the UFP, distinguishes himself or herself by heroism or extraordinary achievement while participating in space combat. The Good Conduct Medal is awarded to any active-duty member of the 7th Fleet who completes 360 days of \"honorable and faithful service\". Awarded for bringing one new recruit into the fleet. Recruit must have listed the officer on their application. Awarded to those officers that completed the original Borg STFs through \'Khitomer Accord\' on a KDF character. Contributing 1 million Fleet credits of resources to Federation construction projects. Contributing 250,000 Fleet credits of resources to KDF construction projects. Joining Fleet 7 Operation against the Crystalline Entity that result in victory. This award counts toward the Fleet Expeditionary Medal. Participating in Fleet Operations on Breaking the Planet. This award counts toward the MACO Expeditionary Medal. Participating in Fleet Operations on The Big Dig. This award counts toward the MACO Expeditionary Medal. Joining Fleet 7 Operation at Starbase 24. This award counts toward the Fleet Expeditionary Medal. participating in Major 7th ITS operations. attending in game Fleet RP events, such as Captain Scott\'s Roleplay Wedding Ceremony or Liberty Calls. joining Fleet 7 Operations to defend the Fleet Starbase. This award counts toward the Fleet Expeditionary Medal. joining Fleet 7 Operations on \'Gorn Minefield.\' This award counts toward the Fleet Expeditionary Medal. 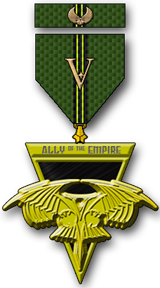 joining Fleet 7 Operations on \'Klingon Scout Force.\' This award counts toward the Fleet Expeditionary Medal. joining Fleet 7 Operations on Nukara Prime. This award counts toward the MACO Expeditionary Medal. joining Fleet 7 Operations on \'The Vault.\' This award counts toward the Fleet Expeditionary Medal. Contributing 500,000 Fleet credits of resources to KDF construction projects. joining Fleet 7 Operations in the Defera Invasion Zone. This award counts toward the MACO Expeditionary Medal. This device for the GCM is awarded after 1080 days of service. Participating in a Roleplay Wargame against Dominion forces. Contributing 2 million Fleet credits of resources to Federation construction projects. Participating in a Roleplay Wargame against Klingon forces. Earned by joining Fleet 7 Operations in the Kobali Prime Battlezone. This award counts toward the MACO Expeditionary Medal. Contributing 3 million Fleet credits of resources to Federation construction projects. Achieving level 15 on all R&D schools, across any number of characters. This device for the GCM is awarded after 1440 days of service. This device for the GCM is awarded after 1800 days of service.